Maps are very useful to a genealogist. Guides to parish boundaries, land ownership, railways and cemeteries are the kind of maps that are invaluable to anyone delving seriously into family history. Anyone who's done any hiking or serious geographical study will be familiar with Ordnance Survey (OS) maps. They were initially part of a defence project during the Napoleonic Wars to survey the British countryside, begun in 1794, but took on a life of their own as the definitive maps of the country. In addition to displaying road and topographical features, maps often identify farms and structures by name. But these days they don't have the detail of the older maps, which were exquisitely elaborate. Thankfully, you can find many of the older ones in reproductions, or in county record office, libraries and second-hand book shops. If you have an old address that's no longer on newer maps (the area might have been demolished), then old OS maps will show you what you need to know. 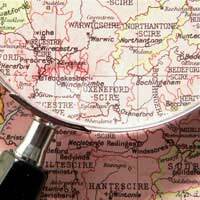 You can find Ordnance Survey, but not the old maps, online. Manuscript estate maps detail the physical layout of buildings and fields (with names!) on a particular estate. They're of great use in pinpointing boundaries and identifying structures, which might be relatively unaltered over the centuries. Some of the maps date from the 17th century, with a single map showing an individual property, whilst a complete volume documents an entire estate. You'll even find lanes, bridle paths and fords. Some maps are closely associated with reference books where you can find listings of owners, tenants and holdings, along with acreage. The repositories are generally in country records offices, although the British Library is a good source, along with the National Library of Scotland. For locating a parish (particularly one that might no longer exist) and its boundaries, tithe maps are ideal. They mostly date from 1837-1850, and were made so parishes could know where to collect tithes. A tithe was a sum, literally one-tenth, part of a person's income that was paid to the church. The custom dated back to the early Middle Ages, when it became a large part of church income.A tithe map survey was undertaken by the British government, a project to map all titheable lands, after which a monetary tax was imposed on landowners - tithes had generally been paid in goods and produce. A tithe award was the document that recorded the amount of the rent, and listed the name of the landowner, as well as those who farmed the land and occupied it. These generally accompanied the map. You can find the maps in the National Archives and the National Library of Wales.